After Guilin we headed to Yangshuo, home of my least favourite street in China, the horrifically tacky and touristy Xi Jie. I'll admit it does have one thing going for it as it's where I bought my pork belly keyring. Outside the touristy town though you're surrounded by rice paddies and the most beautiful karst limestone peaks dotting the landscape. With this in mind we made a move a few kilometres out of town to Chao Long village. First evening there I was walking down the road and could've sworn I saw hundreds of sticks of beancurd skin hanging from beams on a roof top. It was dusk though and in the half light I couldn't be sure so made a note to return in the day time with my camera. I've wrote about beancurd skin before. I love the slightly leathery texture and like all tofu it takes on flavour well, if ever it is on the menu I'll make a beeline for it. Returning to the hostel I noticed Chao Long beancurd skin on the menu, which confirmed my suspicions and also elicited an order. Alas they were out of stock. The next day, around lunchtime, I headed down with my camera and luckily caught them at work. The wife was inside, stirring away at a big vat of simmering soy milk, fired with wood from the pile outside. On the roof the husband hung strip after strip over wooden beams to be dried in the sun. It was a veritable cottage industry beancurd skin factory. Alongside the owners there was also one of the staff from my hostel present who'd popped down to grab some of the raw ingredients for the restaurant. Luckily she spoke English so I found out the buckets of the waste product, a white soy bean pulp, that lay around there were waiting to be used as feed for the pigs. As well as using her translation services I got in my order for lunch and headed back to the hostel with her. Ten minutes from factory to plate has to be a record. The Chao Long Beancurd Skin turned out to be the skin along with red and green peppers (the green had chili heat in a bell pepper sized package) and tomatoes in a light sauce, finished with the spring onions that make a closing appearance in so many Chinese dishes. The beancurd was certainly better than the prepackaged stuff I've had. I've procured the recipe from the chef, albeit minus any weights or measures, so hopefully after a bit of experimenting I can post it up in the future. It's definitely worth a try. This is a special post for me. Back when I started this blog in October 2007 mapo doufu was the first dish I blogged. I'd just bought Fuchsia Dunlop's Sichuan Cuisine and fallen in love with the dish and the cuisine. Sichuan became a food mecca for me and here I am finally there. What more fitting a dish for my first Sichuan meal in Sichuan than mapo doufu? For those that don't know ma po dofu is an oily beef and tofu concoction, heavily spiced with Sichuan pepper and chili. Chewy beef and soft tofu combine with the fiery seasoning in culinary heaven. In Chengdu there's a chain of restaurants specialising in the dish and taking its name so we headed across to Chen Mapo Doufu to try it out. When I've read about Sichuan pepper people always speak of the numbing effect of it - how it leaves your lips tingling - and whilst I've noticed it a bit in dishes I've cooked at home nothing could prepare me for this. Sichuan pepper must not travel too well because here the numbing effect was most pronounced - citrusy, zingy, lip tingling like food has never left me before. I've heard that rural dentists in the region use Sichuan pepper prior to dental work and whilst I wouldn't fancy root canal treatment after it I can well believe the story. I'd also heard that the Sichuan food in London is toned down for the British palate. Anyone that's eaten in Bar Shu or Snazz Sichuan may find this hard to believe (a friend said his body won't let him believe Bar Shu food is toned down) but I can confirm this to be true. This mapo doufu was possibly the hottest thing I've ever eaten. By the end I really thought I could take no more and the girlfriend threw in the towel after one mouthful. Whilst we're confirming things anyone with Fuchsia Dunlop's books may have thought the 100ml of oil in the Mapo recipe was a misprint. It wasn't. Sichuan Mapo Doufu is basically tofu and beef swimming in lip numbing, tastebud destroyingly hot oil. Tasty tofu and beef swimming in lip numbing, tastebud destroyingly hot oil but tofu and beef swimming in lip numbing, tastebud destroyingly hot oil nevertheless. Getting slightly outside Dali one leaves behind the new "old town" and sees a far more traditional way of life. One of the nearby Bai minority villages runs a market every five days and luckily for me it coincided with our couple of days there. Not one to turn down a wet market we hired a guide and cracked on. As we went down the cheap route with our guide there was no private car and we used the local bus for transport. Half an hour outside Dali we passed through Xizhou. I'm not sure if this place lays claim to inventing a flatbread called baba or if it's just known for having good baba but it's definitely famed for them. Lining the main street were a number of identical baba sellers, all having nothing more than an umbrella and a big wicker basket full of the delicacies, and luckily for us our bus pulled up alongside them. Notes were passed from hand to hand down the rather crowded bus (a few minutes later we had to get out the bus, get a taxi past a police checkpoint and then get back on the bus once we'd cleared the overloading check) and then baba made the return journey. They came in sweet or salted and we took the salted - an oily, soft, salty, layered flatbread studded with spring onion and with the surprise of some minced pork on top. Whether they invented it or not it was damn fine street food. I love a good wet market and this was a good one. The food was interesting but reasonably normal - well beside the live piglets and chickens - but the people were amazing. The bright colours, headresses and altitude weathered skin were more reminiscent of the altiplanos in Peru than what I thought of as China. I'll stop here as with any market I think it's better shown off with pictures than words. There were a few street food stalls at the market and one I had to sample was the local tofu. Sat beneath a muslin cover was a big slab of freshly made tofu, not the usual white but a yellow, a colour that, I was told, comes from the yellow beans it was made from. 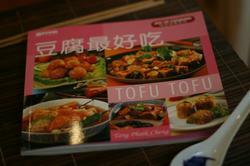 The texture of the tofu was reasonably fim with some pieces having the added support of a darker skin. To stimulate the tastebuds a bit it was topped with pickled veg, chickpeas and rather a lot of chili. As with most things so far in China it was pretty damn warm. For a while now the girlfriend and I have been talking about moving in with each other and finally we’ve done it. Initially we were going to buy a place but I work in credit and you’ve probably noticed there’s a great big credit crunch/sub-prime (although you’d probably never heard these terms before a month or two ago) crisis going on. As such my job isn’t the most secure at the minute so combined with the faltering housing market renting somewhere seemed a good option. One advantage of renting is you get to have a place a bit more expensive than you could afford to buy and so we’ve ended up in a great Victorian school conversion. It’s all double height ceilings, huge windows, wooden floors and a mezzanine level bedroom. In my eyes very cool. Before I start to sound a bit too Nigella enough of the lifestyle chatter and let’s get back on to food. For years I’ve lived in Islington (a very respectable postcode) but although I’ve only moved three roads away from my old abode I now live in Hackney, a borough that holds the most impressive accolade as the Guardian’s worst place in the UK to live. But what do they know? It’s far from that bad though and one thing it does excel at is food. Hackney is as multi-cultural as anywhere in this country and within a few hundred metres of my home I have Turkish, Chinese, Vietnamese, Cameroonian, West Indian, Nigerian and Ethiopian restaurants along with a fantastic Polish store, a pretty impressive (if you like chickens with their heads on and cow’s feet) market and, finally, an Oriental supermarket. Not bad if you’re a fan of interesting food really. Last week I decided to have a look through the cookbooks and was surprised to find a book full exclusively of tofu recipes, I’m going through a bit of a tofu phase at the minute – fried, boiled, silken/smooth/fermented, however – so this seemed perfect for the blog. I picked up a whole series, well pork ribs, hot and spicy and tofu, of these books when I was in Singapore last year and they're full of very interesting recipes. I thought I’d go for something with an out the ordinary ingredient so I settled on a recipe including Chinese chives (I think, we had a bit of trouble determining exactly what these were), fried tofu and king prawns. 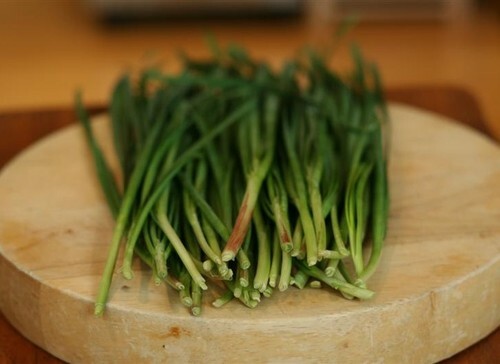 The Chinese chives I bought looked a lot like a bunch of grass, being about 18 inches long and made up of many green blades, similar to water spinach/kang kong. Actually the more I think about it the more I think these weren’t Chinese chives so if anyone wants to correct me please crack on. Not sure what they were though. The lady in the shop said they were but her English wasn't the best.